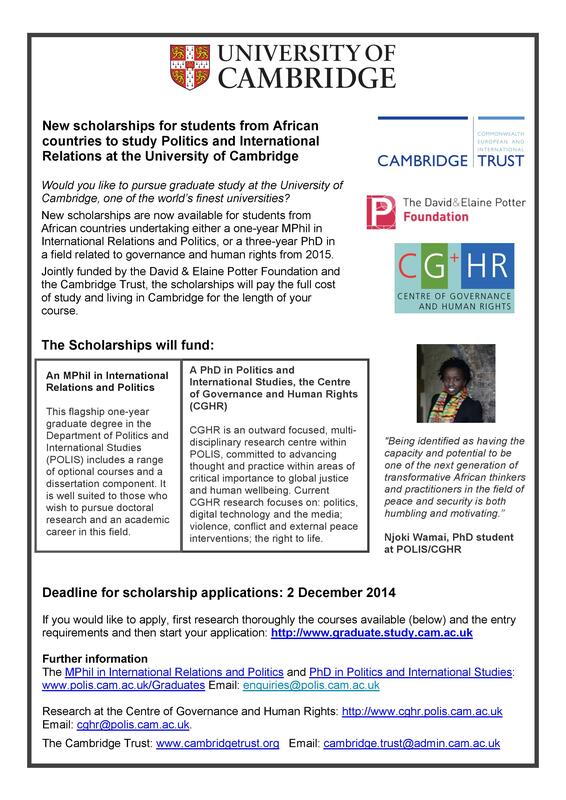 Scholarships for students from African countries to study Politics and International Relations at the University of Cambridge. This is available to candidates undertaking either a one-year MPhil in International Relations and Politics, or a three-year PhD in a field related to governance and human rights from 2015. The scholarships are jointly funded by the David & Elaine Potter Foundation and the Cambridge Trust, the scholarships will pay the full cost of the candidates’ study and living in Cambridge for the length of the course. Information on eligibility requirements, application process and so on are available in the flyer below. In a recent post on the World Bank blogs page, several opportunities available for young Africans of different professional backgrounds to join the Bank were publicised. I have included them below. Read the original post HERE. Fellows will spend a minimum of 6 months getting hands-on experience at World Bank headquarters in Washington D.C. to work on economic policy, technical assistance to countries, and lending for eliminating poverty and increasing shared prosperity. Doctoral students of African descent within one or two years of completing a Ph.D. program in the following fields: Economics, Demography, Applied Statistics and Econometrics, Impact Evaluation, Education, Health, Energy, Agriculture, and Infrastructure. Applicants must be 32 years of age or below. Candidates must possess an undergraduate degree and already be enrolled in a full-time graduate study program (pursuing a Master’s degree or PhD with plans to return to school in a full-time capacity). This is a two-year, entry-level program designed for those skilled in areas such as Economics, Finance, Human Resources Development (public health, education, nutrition, population), Social Sciences (anthropology, sociology), Agriculture, Environment, Private Sector Development, as well as other related fields. Applicants 28 years of age or below, holding the equivalent of a Bachelor’s degree, with some relevant job experience. Candidates will be assigned to one of MIGA’s department to work in underwriting, financial accounting and reporting, as well as economics and risk management (including environmental and social risk mitigation). Applicants under 35 years of age with an advanced degree and a minimum of 5 years working experience in the relevant field. This is a two-year, entry-level program designed for those skilled in areas such as Economics, Finance, Education, Public Health, Social Sciences, Engineering, Urban Planning, and Natural Resource Management. This program is open to applicants under 32 years of age with an advanced degree and a minimum of 3 years working experience in the relevant field. To join the discussion on youth in Africa, follow @WorldBankAfrica on Twitter, and use the hashtag #AfricasYouth. Pls Zainabu I need more highlight about this young African scholarship ,my younger brother want to try it, he has 2.1 in B.agriculture animal science .Please need your help. You can contact committees on Education or Social Development. It is no guarantee, but it could help. That’s all I can think of. I wish you the best of luck. If I get any additional information that could be helpful, I will let you know. Allah Ya taimaka, amin. “Who wants some upgrade? Be prepared to get new soft for your Mac”?.